Code Of Federal Regulations Statutes And Regulations; How are They Made? BOATOWNERS! For information on HINs for boatowners go to HIN 101 for Boatowners. HIN 101 For Boat Owners Rev2. How do I get Hull Identification Numbers and a Manufacturers Identification Code for my boat building company? Q. What do I need to do to build boats and sell them? Call the U S Coast Guard and request a MIC application. See http://www.uscgboating.org/manufacturers/?m=m for more information. handbook_and_regulations.aspx. At the bottom of the page there is a link to download the Boatbuilder's Handbook in PDF format. This is a MIC. It will be the first three characters in the Hull Identification Number (HIN)you place on every boat. Q. 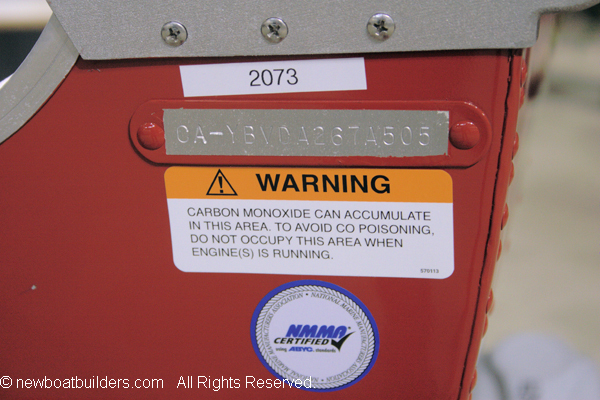 What is a Hull Identification Number? An HIN is a unique number assigned to every boat. You assign this number. Here's how. So, what does it all mean? The ABC is the MIC. The next five characters can be anything you want to assign. It can be 12345, or 00001, or 0000A, or 32001. Whatever you want to put in there except: O, I or Q. These characters look too much like zeros or ones. Some manufacturers use a sort of code in this area. For instance, if they build a 30 footer and this is the first one then they would use 30001. Others just assign consecutive numbers, 00001, 00002, 00003, etc. The ninth character identifies the month when the boat was certified (or built, I will explain this later) as shown in the chart below. So if it's built in May the ninth character would be an E.
The tenth character is last digit of the year when the boat was certified (or built), for example if the year is 1997, then the tenth character would be a 7, or if it is the year 2000, it would be a zero. 33 CFR 181.3 Model year means the period beginning August 1 of any year and ending on July 31 of the following year. Each Model year is designated by the year in which it ends. This means that if a boat is built between Aug 1, 2010 and July 31, 2011 then the boat is a 2011 model year. be designated by the year in which it ends. Upon the request of a recreational vessel manufacturer to which this chapter applies, the Secretary may alter a model year for a model of recreational vessel of the manufacturer and associated equipment, by no more than 6 months from the model year described in paragraph (1). Do not designate a boat as a model year other than as defined in the Code of Federal Regulations. Then cops will come around and start asking nosy questions. Also the owner will have a difficult time insuring the boat. The agent will suspect some sort of fraud if the model year is significantly different from the year built. Q. Where do I put the HIN? On boats with transoms it goes in the upper right hand corner of the transom. On boats without transoms, that is, rounded sterns or pointed sterns (as in canoes), it goes to the right of center if you are facing the stern of the boat. It should be just a short ways down from the gunwale, no more than two inches. It must be at least one quarter inch high and (here comes the hard part) permanently affixed. What does permanent mean. Well, it's permanent until if comes off. Let's get to the point. The whole reason for having this number is to identify who made the boat, when it was made, and what regulations apply. Also the HIN has become a very effective tool in detecting and recovering stolen boats. So, put it where it can be seen. There is nothing that baffles me more than why a manufacturer would put the HIN under a swim platform. How in the world do they expect anyone to read it there? No, put it where a boarding officer, boarding your boat at sea can read the HIN with relative ease, not at risk of life or limb. Q. Is that the only number I have to put on the boat? No. 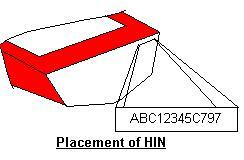 You must also put an identical HIN somewhere else on the boat in a less than obvious location. Don't hide it where no one will ever be able to find it. Put it under a seat, behind a removable panel, under an easily removed fitting. It's there so that the number can be compared to the one on the transom if the boat is suspected of being stolen, or if someone suspects that the HIN has been illegally altered. (No one would do that, would they? Don't count on it!) . This secondary HIN has to meet the same requirements as the first, 1/4 inch high or greater, and permanently affixed. Q. So why do I need an HIN? Every boat (that means any kind of boat) sold in the us (yes that includes imported boats) has to have an HIN. It's so you can track who you sold the boat to, and so the states can register the boats and know that they are not stolen. Q. What does Certification Date mean? When you put an HIN on a boat you are certifying (yes that means guaranteeing) that the boat meets all the standards that the law requires it to meet. That's why I said that the ninth and tenth characters are the certification date. Not really the date of manufacturer. This causes a lot of confusion among builders, dealers and the general public. That date can actually be from any time when you started building the boat until when you put it on the truck for delivery. For boats that are built in a short time, like production boats this can be as short as a day. For large yachts it can be more than a year. Q.What if I build a boat for myself? However, if you think you can build a few boats, sell them and just tell the owner to tell the state it was a backyard built boat, think again. You may get away with it for a while but eventually they will catch you. Those computers are programmed to catch these things. And why go to all that trouble? I costs you nothing to get a MIC and it saves you and your customers a lot of trouble. Q. Are there any other rules I have to follow? Imported boats have to meet the same regulations as boats made domestically. So what about the boats coming in that already have HINs. If the boat is from Canada, then the HIN is good in the USA (and vice versa). The USA has a mutual recognition agreement with Canada and is part of the MIC system. They use MICs starting with Q, Z and Y. Boats from other countries that have MICs are not accepted. The reason is that they have their own system of assigning mics and use the same ones the USA uses, so a boat coming in from France may have the same MIC as a boat built in the USA. So the Coast Guard requires that companies that import boats have a US agent. This can be anyone. A foreign company doesn't have to open a branch office here or send their own agent here. They just need to contract with someone to represent them. Then the Coast Guard assigns a mic to the agent and all the boats imported by that agent will have that MIC. Sound complicated? It can be because some agents import more than one brand of boat. Plus that a lot of imported boats slip through the cracks in the system and cause confusion. So if you want to import boats from Canada, you're all set. You don't need a MIC. But if you want to import boats from anywhere else you have to have one. Also the Coast Guard does not and will not assign a MIC to a foreign builder. The Coast Guard requires that you keep track of who you sold your boats to. This is so you can recall them if necesary. The easiest way to do that is to keep a list of the HINs and who bought it. It also is an easy way to track how many boats you have sold. If one ever gets stolen and a cop calls you looking for the location of the hidden HIN then you can easily cross reference it to the list of HINs, or if they have found a boat they can tell you the hin and you can tell them who bought it. Q. Kit boats: Does this apply if I make Kit boats? Who would do such a thing? Oddly enough, a lot of people do this. The Federal Regulations say very specifically that you cannot alter an HIN once the boat has left the factory: Here's the words. So where does it say I can't do it once it's left the factory? In the original act, now in the US Code, it says that a boat must be in compliance when it is sold, offered for sale, or introduced into interstate commerce. That has been interpreted to mean that as soon as that boat leaves the factory it is in interstate commerce. From that point the HIN cannot be changed. Here is the actual wording. Q. What if I made a mistake? You can write, e-mail or phone the Coast Guard, explain the problem and ask for permission to make the change. They will send you a letter which you should keep in your files, authorizing the change. When will they not authorize it? Almost never under any circumstances other than a bonifide mistake in putting the HIN on the boat. Here are some examples that have arisen. Q. A dealer has brand new unsold boats sitting in inventory from last year. They look like this year's models in every respect except the HIN. Can they change them? Q. Can they send them back to the factory, have them upgraded to this years models, and the factory change the HIN? Q.. A marine repairer or a builder has a boat that has seen a lot of wear and tear. They strip it down to a bare hull and replace everything. Can they put a new HIN on it? A. NO. Putting new parts in it doesn't make it a new boat. There are unscrupulous people who do change HINs. This is a violation of Federal Regulations and they can be fined. How much? $2200.00 per violation. Each boat is a violation. Don't do it. If you think you have a valid reason call the Coast Guard and ask them. The phone numbers are at the top of this page. Q. A 2006 boat has left the factory and is sitting on the dealer show room floor. A salesman looking at the HIN realizes that the last two digits in the HIN are 60 rather than 06. Change they change it? A. Yes, but only after getting permission. Here is an actual series of e-mails with names removed to protect the parties. I got your email from a prior time that you answered a USCG regulations question for me, I could not find another point of contact for the USCG regarding recreational boating. My question for you today is what are the regulations regarding changing hull identification numbers? I know according to sec. 181.35 numbers are not to be altered w/o consent of the Commandant. What stipulations must be met to allow changes authorized by the Commandant? Also, is there any truth to the statement that HIN numbers may be altered prior to the boat leaving the factory? Any help that you can give me on this would be appreciated. You're right. Once assigned, a HIN cannot be changed without specific approval from the Commandant of the Coast Guard. If you give me the details of the particular situation that you're asking about, I can give you my assessment of the likelihood of receiving approval, and tell you how to proceed. If a new (previously unsold, untitled, and not delivered to a dealer or buyer) boat in your factory is determined to have a HIN problem, you can change it; e.g. to correct a format problem. So here is the situation that I was referring to yesterday. I think that I know the answer but I need to cover all the bases. We have supplied a particular dealer with an over abundance of a certain model of boats. In the last year they have not been able to sell any of these to consumers. We have proposed to them that we would bring the boats back to factory and update/upgrade these boats to MY07 standards to help move the product (engines and trailers will stay the same as what is in the boats currently). The dealership also wants us to change the HIN number to reflect the current model year to help in the process. We have not agreed to change the HIN number as we interpret the USCG rules different than the dealership. As I read the USCG regulations, this is not possible but I am obligated to this dealership to get a final ruling from the USCG. Any clarification that you could give me would be appreciated. Thanks for your help. You're right, again. Once a boat leaves the factory we do not generally grant permission to change its HIN. In no case would I expect to see a model year change request granted. As one of my former colleagues used to say, "Even if you replace every part in your 57 Chevy with a brand new part, it's still a 57 Chevy. Please feel free to contact me should you have further questions. Q. What if I get a junk boat or an old used boat that has a sound hull and completely strip it out and install all new structure, electrical, engines, fuel systems and so on. Can I put a new HIN on it or get a new home built boat HIN? A. No. It's not a new boat. The HIN put on the boat when it was manufactured goes with it for the rest of it's life. Just because you put all new equipment in it, it's not a new boat. See the last paragraph of the Coast Guard quote above. Q. What are Country Codes? Country Codes: The International Standards Organization (ISO) has accepted the format of the US HIN except they have added two additional characters as a code for the country of origin. The code for the USA is US. For Canada it is CA. You must leave a space, a hyphen and a space between the Country Code and the 12 character HIN. Below is a Canadian HIN. As of January 2011 The US Coast Guard has withdrawn any proposals to require an expanded HIN. It is voluntary and can be used but is not required. See: The Seventeen Character HIN for a discussion of using seventeen character HINs. 33CFR 174.16(b) As of January 1, 2017, before taking any action relating to a vessel imported or manufactured on or after November 1, 1972, the issuing authority must determine whether the vessel has a primary HIN meeting the requirements of 33 CFR Part 181, supart C.
This means state agencies when registering boats will check to make sure the HIN is correct, not only in format, but is the Manufacturers Identification Code correct for the boat. Does it match the name of the manufacturer. With some imported boats the HIN is not a valid U.S. HIN. This Web site may contain copyrighted material the use of which has not always been specifically authorized by the copyright owner. I am making such material available in my efforts to advance understanding of educational, economic, and scientific issues, etc. I believe this constitutes a "fair use" of any such copyrighted material as provided for in section 107 of the US Copyright Law. In accordance with Title 17 U.S.C. Section 107, the material on this Web site is distributed without profit to those who have expressed a prior interest in receiving the included information for nonprofit educational purposes. For more information see: www.law.cornell.edu/uscode/17/107.shtml. If you wish to use copyrighted material from this Web site for purposes of your own that go beyond "fair use", you must obtain permission from the copyright owner.